Transport models help larger cities to visualise and present the current traffic situation and to look into the future. They provide results that serve as a basis for decision-making and help justify, define and implement transport-related measures. A reliable decision requires a reliable basis: PTV Transport Consult provides you with detailed transport models and forecasts using the market-leading software solution PTV Visum. 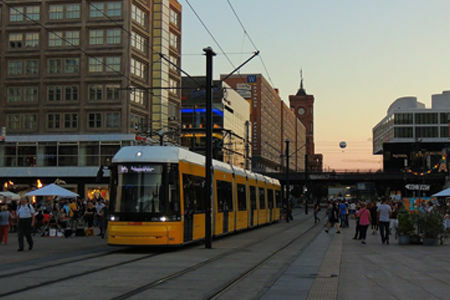 BVG, Berlin’s transport operators, have been using transport modelling for their transport-related planning tasks and decisions for many years. PTV Transport Consult’s experts were commissioned to enhance the current transport model in terms of content and methodology. In motorised private transport, the ownership and availability of a passenger car show a certain preference for using this type of transport mode. If a person or a household has bought a public transport pass or ticket, it can also be assumed that they prefer using public transport. These types of assumptions were integrated into the demand model. The results of supply and demand modelling are usually evaluated in a multi-layered way. Certain evaluations belong to the standard, which analyses the effects of individual measures; other evaluations are more specific. In consultation with the SNB, the necessary scope of evaluation was discussed and defined. After each calculation run, these evaluations are now written to a separate file with a predefined layout through an automated process. The automation is integrated into the workflow. The airports Tegel and Schoenefeld are singular traffic generators through which traffic is fed into the planning area. The incoming and outgoing traffic flows to and from the airports are relevant for Berlin. Here, the parameters differ from normal daily passenger traffic. This applies, for example, to the modal split. For this reason, a separate model was developed for airport traffic, which was integrated into the calculation run for passenger traffic. Every day many tourists visit the sights and hot spots of the city of Berlin. The number of routes taken by tourists makes up a significant proportion of the existing traffic, especially in the inner-city areas. And this kind of traffic is of great importance for public transport. Since tourists have a different travel behaviour than the residents of a city, a separate, existing transport model was adopted and integrated into the calculation runs.